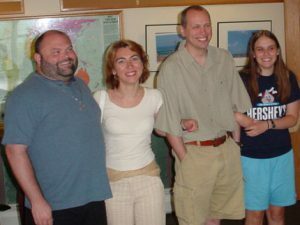 The Nord-Amerika Somera Kursaro (NASK - North American Summer Esperanto Institute) is an intensive immersion program in Esperanto. Prior to 2002, NASK was hosted for 31 years at San Francisco State University. From 2002 to 2006, the program was hosted by the School for International Training (SIT) in Brattleboro, Vermont, in 2007-2011, by the University of California at San Diego, in 2012, by the University of Texas at Dallas, in 2014 by the University of Victoria (Canada), and in 2013, 2015, 2016, 2017, 2018 at William Peace University in Raleigh, North Carolina. In 2019 NASK returns to William Peace University in Raleigh, North Carolina for the sixth time. In this special 50th anniversary year there will be five levels of instruction including a post-beginners level taught by Hans Becklin (USA). Two intermediate levels are available. One will focus on "Language and Performance" with Alena Alder (USA) guiding playful and lighthearted learning activities. Berke Dochhorn (Germany) will lead "Language and Grammar for those wanting a more traditional classroom experience. The advanced "Language and Literature" class will be guided by István Ertl (Hungary) and Bertilo Wennergren will teach the advanced grammar class entitled "Language and Grammar. Students will arrive on Saturday, June 29th and leave on Monday, July 8th. Lessons will take place from June 30th to July 7th. Residential registration includes housing (a shared room), meals, and instruction. A limited number of private rooms are available. So, register early! For returning students there is a special 50th anniversary price of $749. There are options for local students not lodging on campus. Registration is required. Request a registration form for more information at: eddyellen@aol.com or visit the web site: nask.esperanto-usa.org/venonta. Stipends are available for full-time students. Contact Ellen Eddy at eddyellen@aol.com for information on stipends. Please address issues in paying via PayPal to admin (at) esperantic.org. Private rooms share a bathroom with the adjoining room. All residential students wanting a private room must add $250.